I have often thought, I should just marry an Italian, so I can eat like this every day! Way down a back road in Dixon, Missouri surrounded by farm land sits Di Trapani's Italian Bistro. When I first arrived, I sort of thought this was the perfect setting for a bar - but it's not - it is a very classy family friendly Italian Restaurant! Walking in Di Trapani's I realized this was truly upscale family dining (no black tie needed, but very classy) the place you would feel comfortable taking your friends, your kids, and even grandma. This place is obviously well known by the locals, but worth the drive for the tourist! As I sat down at Di Trapani's - I became overwhelmed by the menu - so many options - why should a girl just choose one! 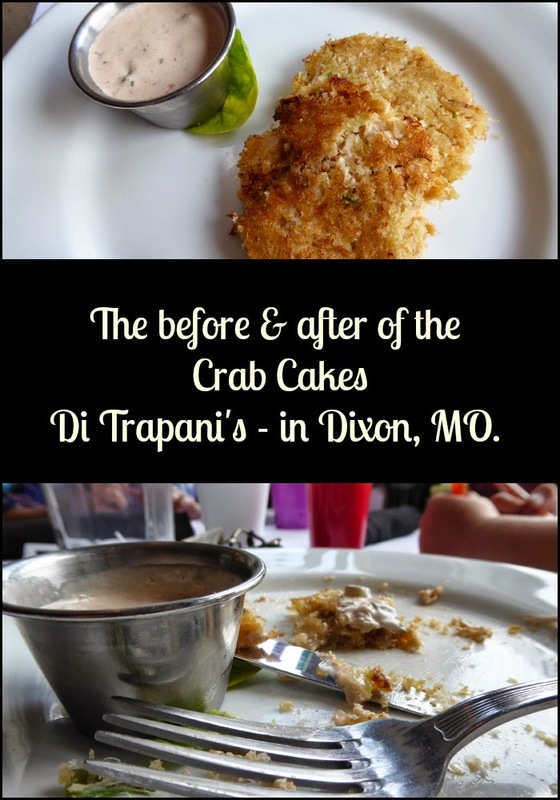 I started my dinner out with Di Trapani's Crab Cakes - normally I am not a huge fan of crab cakes, I am a fan of crab, crab typically belongs with cheese ( in my way of thinking) - and my kids had never ever had crab cakes - so we gave it a try! Obviously they were a hit! My next course was the salad, now I had heard they add some amazing dressing, but I am a true Missourian, and believe in the "Show - Me" concept. Well Di Trapani's did - wow! Let's just say I could literally make a meal on their salad, and am a little sad that I did not buy a bottle (or case) of their dressing before I left that day! Their House Salad - there is a secret recipe behind it, but it is secret! When it came to the main course, it is obvious who has a taste for Italian in our family and who does not! Lesse - my little Alfredo lover - ordered Di Trapani's Alfredo, her final review of the food, looked a little like this - must note, she does not get her table manners from her Momma! D-man was not feeling as adventurous and settled for a grilled cheese sandwich with french fries - he says it was delicious and I am sure it was - sometimes boys can just be difficult. 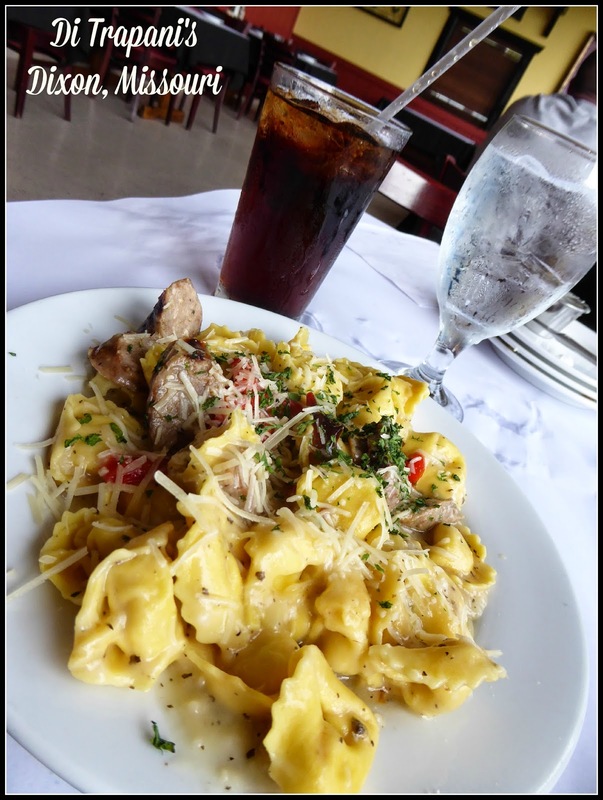 I am a bit of a tortellini lover, so that was my choice entree - and it I am glad I chose it! Fabulous - I was glad I wore a dress, so my pants did not get to tight - because I wanted to enjoy EVERY bite! My Meal: Cheese Tortellini Salsiccia: Italian sausage, roasted red peppers and lemon butter garlic sauce. After dinner, the staff of Di Trapani's surprised us with dessert - and while I did not need it, I was so grateful they did! I am going to assume they labeled me as a coffee drinker when they brought out Dominic's Tiramisu - because I am a sucker for anything coffee flavored - and the Tiramisu was delicious! Now, the one thing that stuck out the most about Di Trapani's was the view - now remember I said they were surrounded by farmland way out in the middle of no where - well here is what it looks like out there! Obviously the view matches the food! Di Trapani's also has a couple sets of binoculars sitting around for you or the kid to enjoy the view, or catch a glimpse of an Eagle flying by!